Epson SureColor SC-P5000 Driver Download. 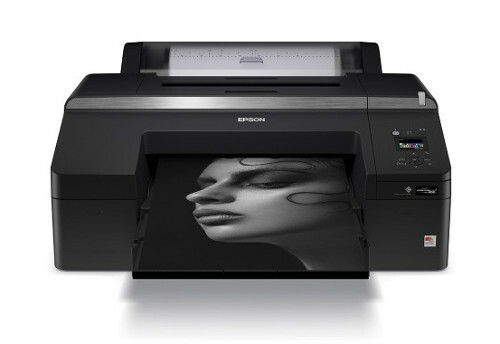 This Epson SureColor SC-P5000 is a new A2 + printers include professional photographers who want to create great fine-art prints. The SureColor SC-P5000 replaces the Stylus Pro 4900. Its HDX ink set can be optionally equipped with violet or LLK ink (Light Light Black). In the case of the violet ink, it is to be used mainly for the exact reproduction of logos, for example in packaging. According to Epson, it covers 99% of the "Pantone Solid Coated" colors. The LLK-Variant, on the other hand, is aimed at photographers who want to create fine-art prints. The new yellow is said to have a higher pigment density. A total of eleven colors are used (Light Black, Light Black, Black, Matte Black, Cyan, Light Cyan, Yellow, Vivid Magenta, Vivid Light Magenta, Orange, Green). The print resolution is 2880 x 1440 dpi, the droplet size at a minimum of 3.5 pl. The ink tanks hold 200 ml. Officially, Epson announced no price yet. The printer is, however, for example at Calumet available for around 2375 euros. Epson brings a new inkjet printer that can reproduce colors reliably and also use violet. Even the most pantone colors can be represented. The Epson SureColor SC-P5000 printer is suitable for proofing as well as high-quality photo and art prints in formats up to DIN A2 + and prints at 2880 x 1440 dpi from paper cassettes, from the roll or on individual sheets. With its SureColor SC-P5000, Epson introduces a new DIN A2 + or 17-inch printer that reproduces up to 99 percent of the Pantone Solid Coated colors thanks to its HDX ink set with optional Violet or LLK. Up to 99 percent, or approximately 98 percent, of the "Pantone Solid Coated" color on the Epson Semimatte Proofing Paper is covered with the Violet ink. The new P5000 is available in a total of four equipment variants and is predestined for certain tasks, depending on the chosen variant. The model with violet ink is particularly suitable for proofing tasks in the fields of packaging and advertising, as well as the model with the LLK ink for professional photography as well as fine art. All leading RIP manufacturers already support the new P5000, optionally also A built-in SpectroProofer is available.